Is it weird that in my three years of living in Portugal, the food I missed the most was kale? Well, it’s true. More than peanut butter, more than cheddar cheese, more than my beloved bagels, I missed kale. Kale salads, kale soups, kale wraps with avocado, kale raw or sautéed or baked into crispy chips. So, you can imagine my delight when I was walking through my local supermarket here in London and saw a beautiful bunch of kale just waiting to come home with me. I might have squealed, just a little. In the last week I’ve eaten kale every single day, in one form or another! Then yesterday I rediscovered this gem of an article: “31 Grilled Cheeses That Are Better Than A Boyfriend“. … and the rest was history. 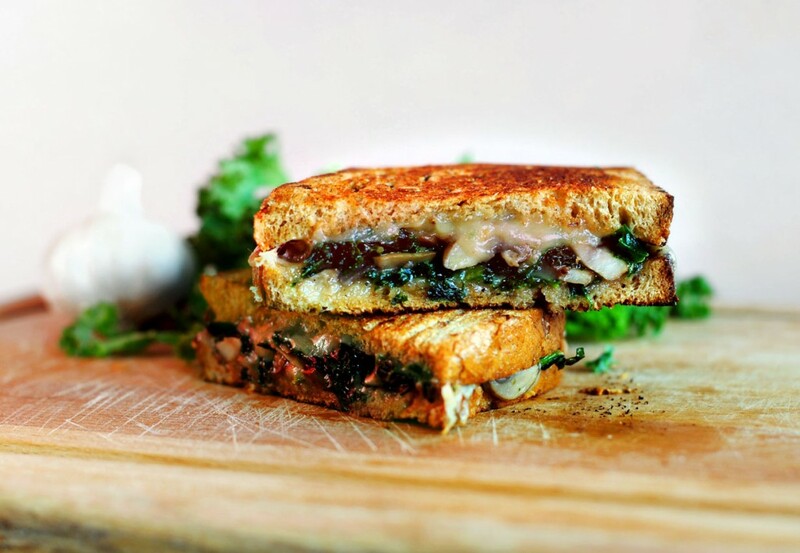 Or better, and the rest was a kale and mushroom grilled cheese sandwich! So tell me, what foods can’t you live without? The trick to this (and any) grilled cheese sandwich is to toast both sides of the bread. This makes the sandwich extra crunchy and therefore extra delicious. Also, make sure you use a good-quality, thickly sliced bread! Sourdough would be excellent. Now let's talk cheese. I used cheddar because that's what I had on hand, but I think this recipe would be delicious with swiss or gouda cheese. Mmmmm, gouuuuuda. Heat olive oil in a small skillet over medium heat. Add garlic and cook for 2 minutes. Add mushrooms and cook until the mushrooms begin to release their juices. Add kale and cook until tender - about 5 minutes. Season with salt and pepper, and set aside. In another skillet, melt butter and lightly toast two slices of bread on one side. 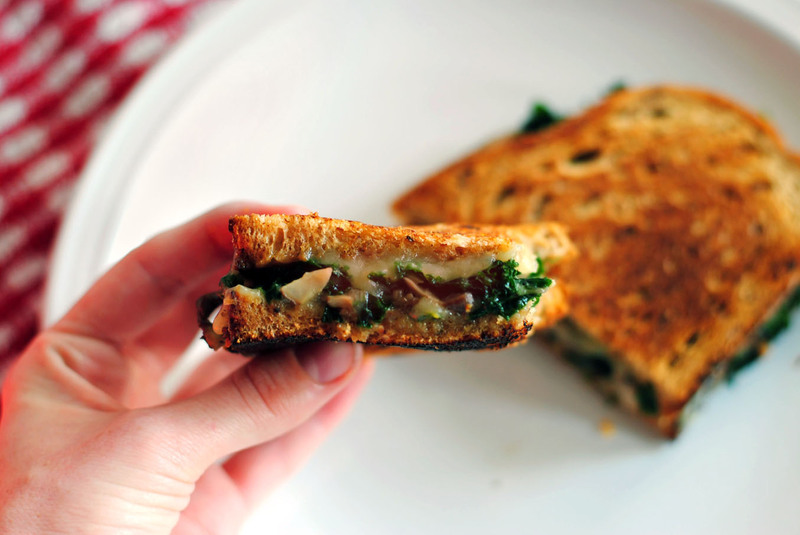 Flip the bread, and add a slice of cheese, then the kale and mushroom mixture, then another slice of cheese. Top with the other slice of bread. Cook on one side until bread is lightly toasted (add more butter to pan if necessary) and then flip and cook on the other side.